Quinoa Flour (29%), Corn Flour, Rice Flour, Corn Starch, Lentil Flour, Pea Flour, Rapeseed Oil, Chilli & Lime Seasoning (7%) (Sugar, Rice Flour, Dried Red Bell Pepper, Salt, Spice (Cayenne Pepper, Cumin), Citric Acid, Garlic Powder, Herb (Parsley), Natural Flavouring, Onion Powder, Colour (Paprika Extract), Rosemary Extract), Sugar, Salt. Free from all 14 declarable allergens. From the ancient and timeless cultures of South America comes a revolutionary new snack made from Quinoa grains. The grain first domesticated around 3000 years ago, was also held sacred by the Incas who valued it for its nutritional benefits. Quinoa today is considered to be a "Superfood" all around the world. By harnessing this "Supergrain" source to Eat Real's ever-expanding range of snack products, Eat Real is delighted to bring these tasty light Quinoa Chips in mouthwatering flavours. 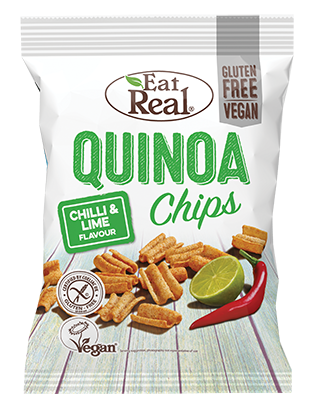 Eat Real Quinoa Chips are a crunchy and crispy snack made from quinoa flour, flavoured with chilli & lime. Eat Real snacks are based on three very simple concepts that are Taste, Nutrition and Real Ingredients. Eat Real's desire is to create a product that is an enjoyable healthy alternative to standard snack and confectionery items and to distinguish themselves from other brands that are ever present on supermarket shelves. Made from real, natural ingredients with 29% Quinoa and no added nasties (artificial flavourings, colourings and preservatives), Eat Real have something for the whole family that can be enjoyed at any time of the day!